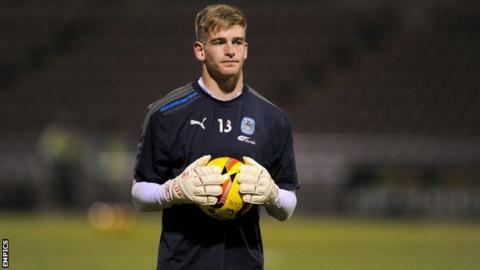 Coventry City goalkeeper Lee Burge has pledged his immediate future to the League One club by agreeing a new three-year contract. Burge, 21, a Sky Blues' Under-21s regular throughout the 2013-14 season, came through the club's academy system. "We believe that Lee has a very bright future," Sky Blues development director Steve Waggott told BBC Coventry & Warwickshire. "We look forward to him realising that potential with us." Burge, who signed his first one-year professional deal with City in July 2011, enjoyed a successful loan spell at Conference Premier Nuneaton Town for the last three months of the 2012-13 season, keeping 10 clean sheets in 17 appearances. He was on the bench for all but two of Coventry's matches (when teenager Alex Gott deputised) this season, as back-up to Joe Murphy during the club's successful bid to stay in League One. Burge, whose new deal runs until the summer of 2017. is yet to make his first-team debut for the Sky Blues. But he might get his chance if first-choice keeper Murphy, whose contract expires this summer, fails to agree a new deal. Murphy, along with midfielder Mark Marshall, is still in negotiations with the club, while Franck Moussa and Cyrus Christie are likely to leave when their contracts expire in June, both having failed to agree improved terms.